Why wouldn't it be a good thing? It holds water, he fits inside, it's soft, he has no sharp edges so he won't puncture it...seems perfect to me! 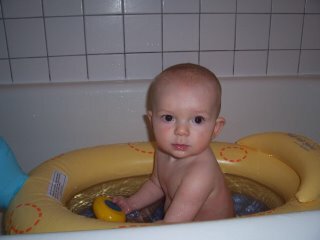 Love his expression -- he's quite serious about his bath time! I think the most important thing isn't the tub itself but the parent watching the kid while heis' in it.